Habit: Annual, strigose. Stem: decumbent to erect, 1--4 dm. Leaf: cauline, lower 1--5 cm. Inflorescence: bracts near base. Flower: calyx 5--8 mm; corolla limb 1--2.5 mm diam, appendages yellow. 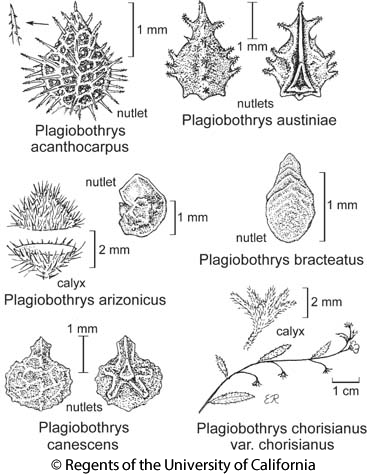 Fruit: nutlet 2--3 mm, ovate, acuminate, +- granular, shiny; abaxial ridge, lateral ridges prominent, cross-ribs 0 to obscure, prickles (0) or on ridges, few, stout, barb-tipped, +- 0 adaxially; scar near base, +- triangular, deep-concave. Synonyms: Plagiobothrys austinae, orth. var. Citation for this treatment: Ronald B. Kelley 2012, Plagiobothrys austiniae, in Jepson Flora Project (eds.) Jepson eFlora, http://ucjeps.berkeley.edu/eflora/eflora_display.php?tid=38486, accessed on April 22, 2019. CaRF, n&c SNF, e ScV, ne SnJV; Markers link to CCH specimen records. Yellow markers indicate records that may provide evidence for eFlora range revision or may have georeferencing or identification issues. Purple markers indicate specimens collected from a garden, greenhouse, or other non-wild location.